This weekend was spent promoting Fate Saga at Florida Anime Experience in Kissimmee, Florida. It was my first time actively promoting my original series at a convention and it'll be a little while before I'll know if it had any effect. But overall I think the outlook is promising! The convention was small, but a lot of fun and the special guests, voice actors Steve Blum, Brett Weaver and Brittney Karbowski were so incredibly nice! I had an art table where I sell my normal items, but this time I also had an extra sign with Fate Saga prints, as well as postcards and my laptop constantly playing the trailer at a low volume. I pitched the series to everyone - and I mean everyone! Regular con-goers, merchants, fellow artists, the guest voice actors and the fellows running the con. The pitches went better for some than others. Some were doing the whole nod and smile thing, but others seemed genuinely interested and a few gave some really good advice for where I can go from here. Overall a good experience! This was Guile's pitch illustration for the pitch book and poster for the presentation to Warner Brothers. 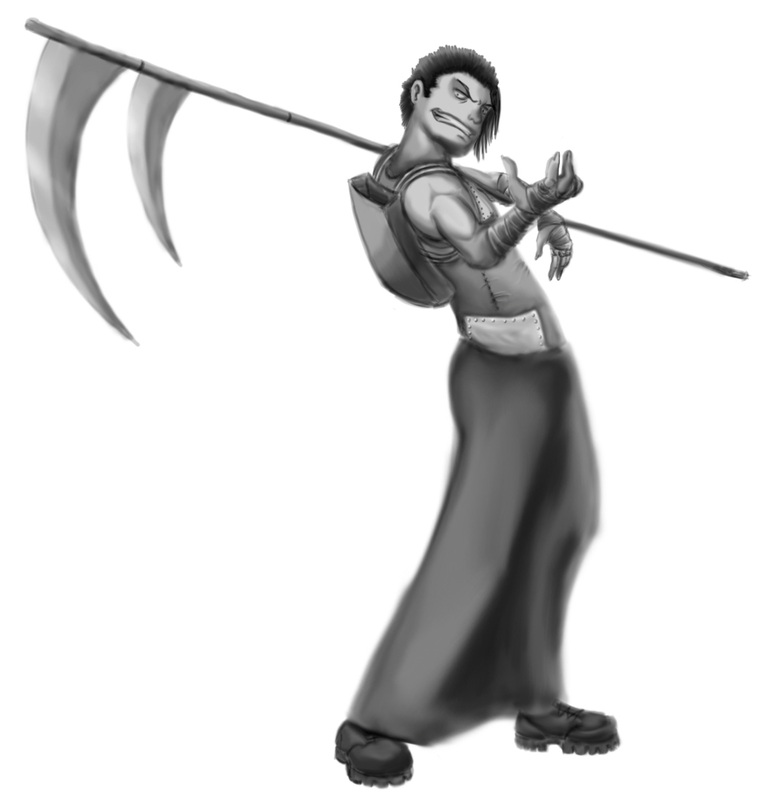 This one, along with Bianca and Lukas, I think were two of the more successful illustrations. I had a lot of fun drawing Guile almost bursting from the page. Here is version 1 of the video pitch. There will soon be a pitch section on the blog, in which this video will be kept. But for now, I am still working on the video itself. As I make more visual content (concept art, animations, etc.) this video will likely be adjusted to incorporate more of that into it. If there is anything else I can do to make the visuals more interesting, please let me know! I may re-record some of my voice if there are any parts that are unclear or not enthusiastic enough. It was an interesting balance of giving as much information as possible while keeping everything fast-paced and interesting. EDIT: Enlarged the log line text from 11pt to 12pt font. This is my entry-in-progress for Animation Magazine's 2011 Pitch Party. It's pretty much complete, with a couple of small alterations to make to the shadows, but I wanted to upload it here for critique before I send it out. Because of the limited space in this entry, I figured it would be best to keep it down to just the log line. The background is taken from the Fate Saga postcards, and I tried to use the group shot from it as well, but the group shot was designed for horizontal format, not vertical. The characters had to shrink down too much to fit, and it simply didn't work. As a result, I decided to use Cain's image, from the posters I used when I was advertising at SCAD. It worked well as an advertising tool at the college, and adding the background and shadows I am hoping will help with the dramatic effect. Finally, with the blog's link on the bottom, it should give readers an easy way to access more information about the series. Cyrus has trouble sleeping, whether it's in Fate Saga or any other incarnation of him that appears in any crossover situation. He has a tendency to stay up as long as he possibly can, until he faints from exhaustion. In this lovely drawing by my dear friend Tracy MacLauchlan, Cyrus passed out from exhaustion and Veil, having found him, is putting him to bed. Cyrus is also wearing pants with suspenders because that's his way of showing his affection for Veil. Veil likes fashion - and always yells at Cyrus to wear some freaking pants. Sometimes, when Cyrus wants to be nice or do something good for Veil, he'll listen. 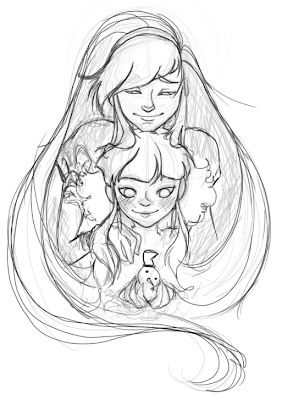 This is a gift art by my amazing friend, Yesenia Carrero, of Fate Saga's Larkspur and The Taffeta's Elena. Elena is a tiny and needy girl who looks for those bigger and stronger than her to shower her with attention and affection. 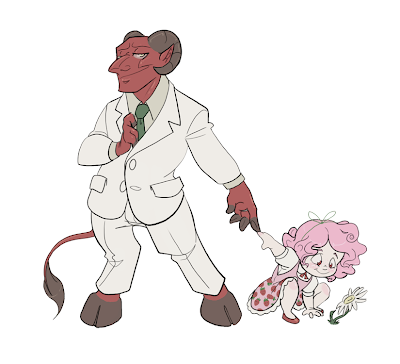 Larkspur, being a cleric and a motherly type, takes to the young girl fairly easily and is unaware of the more sinister side of Elena's character. This picture is an older version of Elena's design, and she has become a siren since then. Feel free to check out Yesenia's blog, as well as Elena's story in The Taffetas. I originally wanted to draw this with all three of Rori's forms, with her normal wolf form (the form you actually see her in the most) coming up from the bottom of the illustration. However, because the wolf form and were-form have the same markings and both retain all of their canine features, it ended up looking as if I had the wolf or were-form drawn twice. 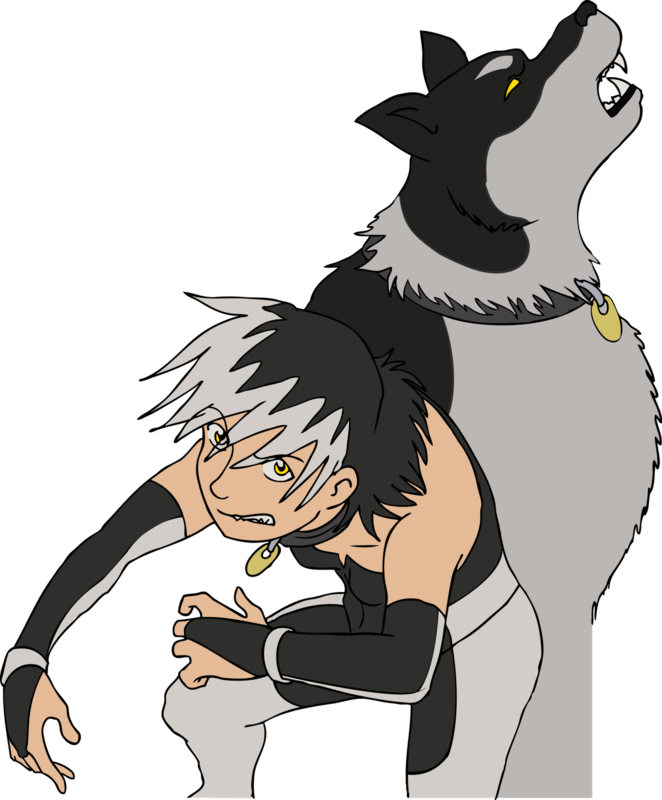 It also cluttered the image, so it was decided to take out her normal wolf form in favor of showing off her human and were-form. However, an important fact about her character is that the collar she's wearing represents that she actually truly in her human form. During the series, she receives that collar as a way of masking her inhumanity behind the same illusionary spell that the Draken use. 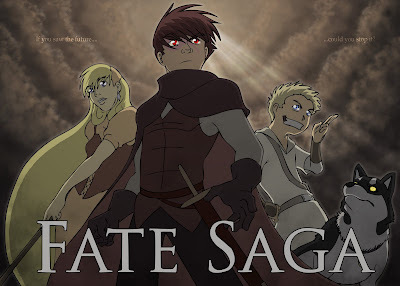 I am excited and happy to announce that Fate Saga's trailer will be presented at Solomon's Treasure Film Festival on May 28th 2011, in California State University Los Angeles! This was the voice acting test with Celia, recorded from my laptop. Not only did she do a fantastic acting job, but the poor girl was even sick with a cold and still did so well. I had her voice the lines the way she wanted to, then had her try them the way I had imagined it. Interestingly, when I listened to both versions later, I ended up liking Celia's interpretation of Rori's voice more. She makes Rori sound more raw and emotive, especially during the last half of this test. It really shows the desperation and wrath in Rori's character so well. The most important aspects of her character which I was hoping to come through in her voice is that Rori is harsh, cold with an underlying anger/cynicism. I think Celia captures all of that very well, and also has a naturally deep but still feminine voice which matches the character. 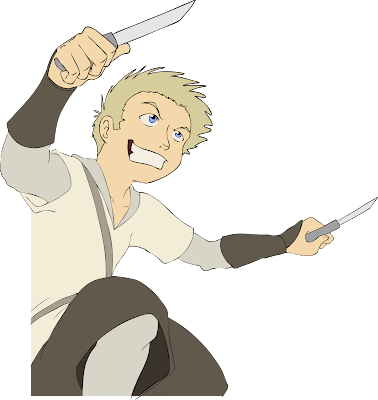 This is a wallpaper for Rori Alistair, the 'angriest little were-wolf' of Fate Saga! Rori was a were-wolf hunter who was betrayed by her fiance and changed into one, herself. Enduring the weight of the betrayal and forcibly abandoning the only life she had ever known made her a angry and bitter woman, who is desperate to cure her lycanthropy. Although she has some loyalty to the other heroes, her moral ambiguity often puts her at odds with Cain. Rori can be a powerful force...when she can be convinced to help. But most of the time, she is only pursuing her own agenda. 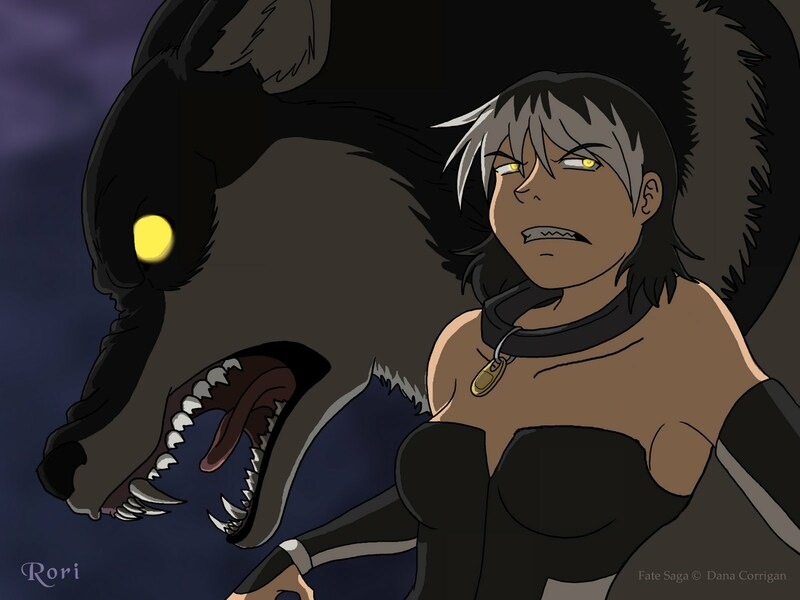 EDIT: Fixed Rori's breasts and darkened the wolf in the background. 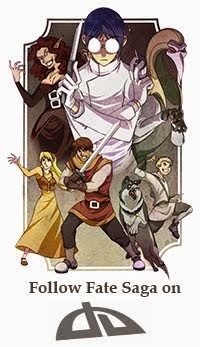 This is a crossover illustration I did last year of Fate Saga's Cyrus and an older version of The Taffetas' Damien. Damien looks completely different now, but if he and Cyrus were to see each other again, this is pretty much what would happen. 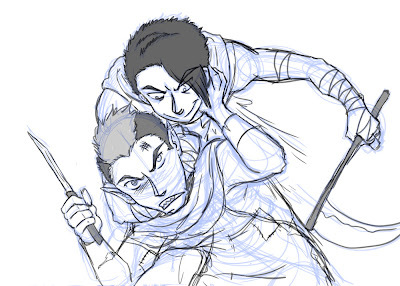 Cyrus and Damien are both too similar to each other - in that they're violent and brash young men - to be able to be anywhere near each other without sharp weapons blazing. Of course, by Cyrus' saucy smile, he thinks he's got Damien beat. He'll have to beware of Damien's poisonous bite, though! 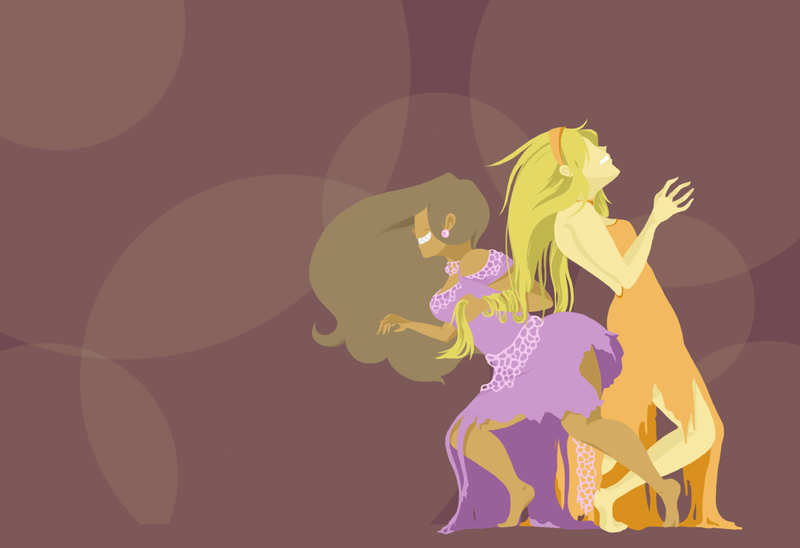 If interested, feel free to check out Damien's story on The Taffetas' blog! These are gift arts by Tracy MacLauchlan, of Fate Saga's Drax and The Taffeta's Cotton. We often like to throw our characters together in different scenarios to see how they would interact. 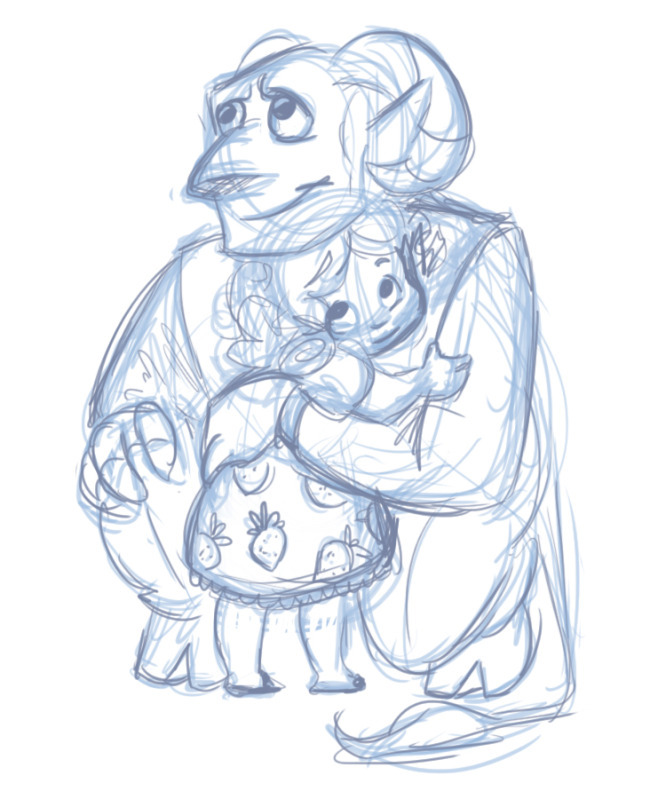 So what would happen when the political figurehead of Duero, Drax, meets with the adorable Cotton? The answer - use her adorable cuteness to sell lemonade and make himself look good. Of course he pays her...in hugs. Drax is dressed in The Taffetas' style 1950's outfit. Look at his googly eyes! He's so sincere! If interested in Cotton or The Taffetas, be sure to check out their blog! This was a concept illustration for the Pilot, for a flashback that didn't make it. A scene like this may still exist, just not during the pilot. This is the moment where Cain confronts the dragon that saw destroy his homeland in a vision. It was very important for me to get the perspective right. 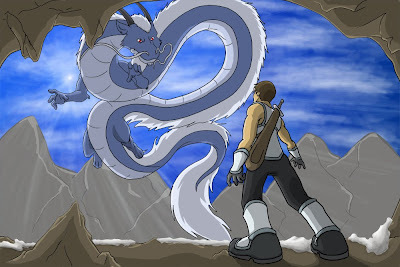 I wanted the dragon to feel as large and imposing as possible, but while still looking up at Cain as the hero who will (hopefully) stop it. The last few weeks has been dedicated to the task of figuring out the who, where and how of pitching. For Warner Brothers, I had the advantage of having the opportunity presented to me through Savannah College of Art and Design (one of the many reasons why SCAD is a fantastic college.) I've come to realize just how difficult it is to get an audience with companies. Many won't even listen to you without an agent or some other form of representation. I guess it makes sense. They don't want a bunch of newbies with ego trips to pitch ideas they've all heard before. However, there is hope! I've also discovered that there are pitching conventions where you can get an audience with the companies, as well as festivals which accept trailers and tv pilots. I'm also trying to network and get connections with some of these studios, so I can slip my pitch in to them. 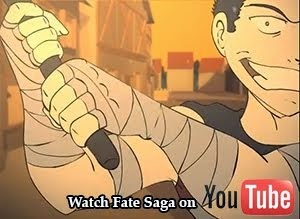 Currently, I'm working on a video pitch for Fate Saga - for sponsors, channels and studios. It will also be posted on this blog and will be the next major update. The video pitch will also be used for Kickstarter, though possibly with some alterations. In the meantime, let the pitching research, festival preparations and video pitch editing commence! Happy Mother's Day from Fate Saga! 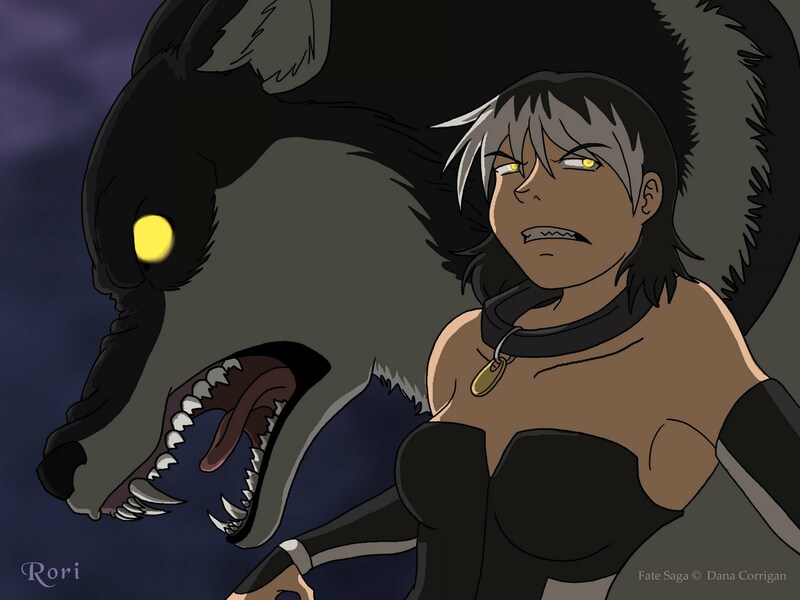 This image is a cross between a general Happy Mother's Day and a "what could have been" featuring Fate Saga's angriest little were-wolf, Rori. When Rori was a teenager, she became engaged to the love of her life, Jade. But he betrayed her, and changed her into a were-wolf, which made her into a bitter, aggressive woman. 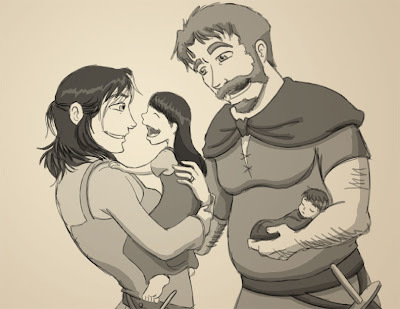 This picture is what would have happened had her fiance never betrayed her, and they had the marriage and children that Rori had dreamed of while they had been together. This was a gift comic drawn by my incredibly talented and amazing friend, Tracy MacLauchlan, of a crossover scene with Fate Saga's Cyrus and The Taffetas' Veil. Cyrus is a little crazy (little being an understatement), and at times Veil has to calm him from fits. This scene never happens in either Fate Saga or The Taffetas, and is instead based off of what-if crossover scenarios. If interested in Veil or The Taffetas, I highly encourage you to take a look at Veil's story on The Taffetas' blog! This was a greyscale illustration of Cyrus, to practice painting from dark to light. It was a little brain breaking because it's completely different than the way I normally work - I always work on the lines first and add color/shadows/etc. later. This piece doesn't even have lines. Regardless, it was great practice for painting more realistically. Interview with Clean Up Artist and Colorist, Amelia Colvig! Fate Saga Crew Self-Interview! from Amelia Colvig on Vimeo. This is an illustration for the Fate Saga postcards that I will be giving away at the upcoming conventions. It was important to showcase the heroes and make them look as dramatic as possible, to hopefully attract people and give a good impression of what the series will be like at first glance. Soon, I will be designing the other side of the postcard with information about the series, the blog and Kickstarter's link and information once I have it. It has been suggested to me to do a version of the postcard with the villains, and to sell this image and the villains as posters and prints, which I am also considering. I had made this image at a very large size, at 300dpi so it would be possible. 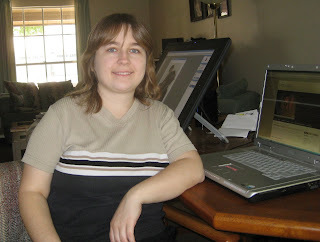 Feel free to check out Gemini's story in The Taffetas blog.